The Lost Performative NLP Language Pattern is a Distortion from the NLP Meta Model. It is jumbled up info about the speakers Model of the World the persons specific belief, that lacks clarity and about the actual limitations in belief at this point. It is a Value Judgement of what is an important belief to the speaker. This one is like placing high value or emphasis on what we are saying, while not including most of what we are saying. So what the speaker is saying, is vague at best. Which makes it super Persuasive / Hypnotic due to the ambiguity the listener needs to move into the direction they are steered into with the speakers statement. So we would like to know Who the person is who is doing the judging and how does the speaker knows this for sure. In other words, you really just want to know How the person knows the information. we will restore the deleted and Distorted Info. The speaker may not have a real answer and therefore will need to consider their own attachment to the judgement. It has been said the person with the most certainty wins, so this statement will be challenged one question at a time. The people who is using this types of language believes them to be absolutely true and without exception. Of course this demonstrates their own deep structured belief system. I like to think of belief change as simply moving stacks to where you would prefer them to be. We will separate each statement as a layer on the belief stack and examine it by beginning with the following, and following the thread until all of the missing info has been recovered. Then we will create new more useful stacks of certainty in the favour of the speaker in a Coaching context, in a Sales or Business Context. Win / Win = For the good of all involved. ****Please note: I am not a therapist and this is why I have not spoken about any other context. I have come to realize there is little or no value in judgement. It simply is just not the only way to formulate an opinion and since people are experiencing through subjective reality it does not communicate the whole story. I prefer to act on a case by case basis. Never listen to other people who say you cannot do something. It may be true that they could not do it but perhaps you can! Here is an exercise you can use to Challenge a Judgement or to Install a Judgement, like in Hypnosis. It is because you are noticing your eyelashes getting heavy that you can just close your eyes .. now. By asking one of the suggested questions above, you are encouraging them to continue thinking about how they know this information. In the questioning process the speaker will come to realize their belief can be adjusted. These deletions of the who the Performer is usually house pockets full of pain regarding the specific areas in which the speaker is mentioning. During conversation these will be loosened by this exercise and perhaps replaced with the news stacks. Find out about NLP Practitioners training here. Enjoy playing with this language pattern to move the process forward. Thank you for stopping by. 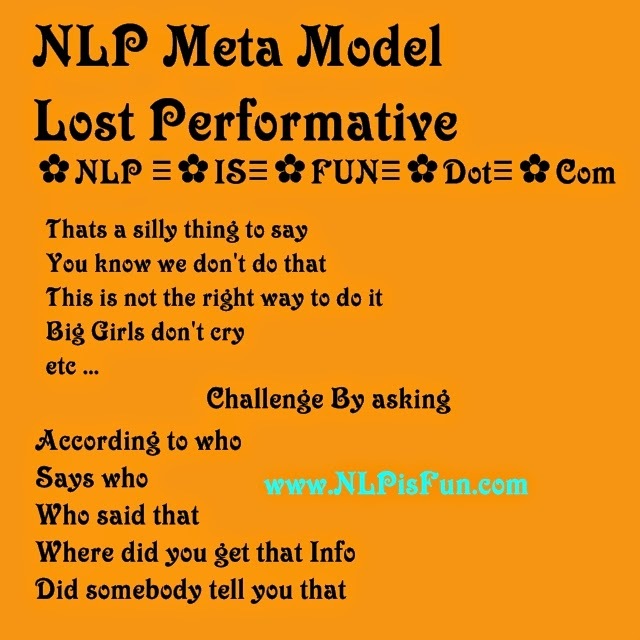 Come back and find more NLP Blog tips there is over 200 NLP Articles and NLP Language Patterns here.